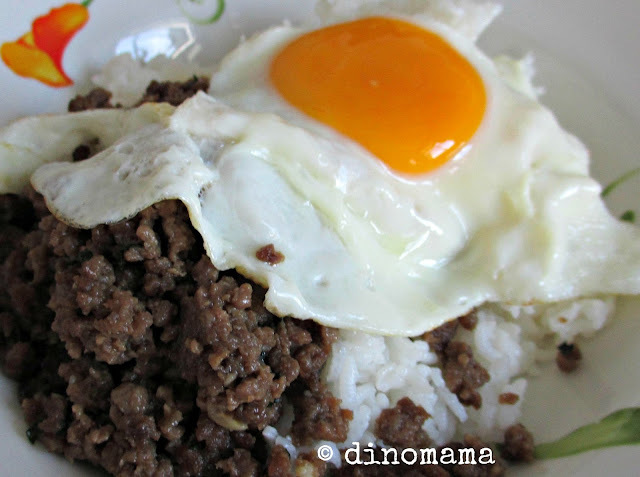 When I saw Mama Sue linked her Basil Minced Beef rice in one of my Foodie Fridays post, I know I just have to try to make it. My first attempt was a failure as I do not have fish sauce, I replaced it with light soy sauce which is a mistake as it makes the beef way too salty. So I made it again, this time with the fish sauce. However since I am sharing this with DinoBoy I did not put too much basil leaves as I was afraid he may not get used to the basil taste. I was very happy with how the beef & rice turned out this time, even the sunny side up; which incidentally was the first time I do it since so long ago, looks bright and sunny too! It would be perfect dinner if we had some Campbell soup, I didn't think of that so we had to drink water instead, ah well~~ it will be better the next time I plan to cook this again. Usually I will marinate my meat and leave it for about 30mins or half a day (if I am cooking on weekends), however Mama Sue told me the beef (she don't take pork) will be tastier if its marinated over night. I did that this time and wow~ the beef really taste better. Try it and see if you feel the same.